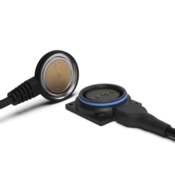 We are delighted to announce the launch of our new innovative magnetic connector Stingray. Stingray is a low profile, compact, and sealed connector that sits flat against the body to prevent snagging and damage. It’s self-aligning due to its strong magnetic connection and allows customisation and flexibility of cable routing. 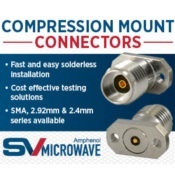 SV Microwave manufactures a large variety of solderless precision RF connectors in high frequency bands including the mmWave frequencies. SV offers a variety of cost effective coaxial PCB mount SMA, 2.92mm and 2.4mm connector series. Our solderless application makes assembly fast, easy and without damaging the PCB board. Additionally, SV can customize a PCB footprint design for your application using our latest simulation technology. 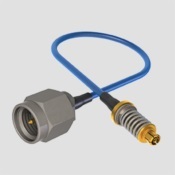 SV Microwave now offers a complete line of VITA 67 coaxial/RF cable assemblies to 2.92mm (SVK) male connectors. SV’s unique connector retention mechanism makes installing and removing the cable assemblies easier than competition! SV's floating SMPM coaxial contacts ensure excellent RF performance in any mating condition. These parts are also designed for side-by-side implementation with VITA 46 hardware and are cabled to Ø.047 and Ø.086 coaxial cable types. SV has more coaxial PCB available through distribution than EVER before! 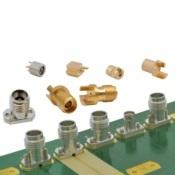 SV Microwave’s PCB connector designs are ideal for high density applications, while allowing for axial and radial misalignment to compensate for tolerance stack up. 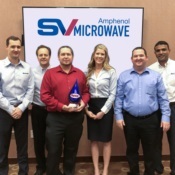 SV Microwave honored Digi-Key Electronics with the “2017 Distributor of the Year” award for their outstanding performance. The award is based on point of sale (POS) growth, customer reach, engagement efforts, market expansion, inventory breadth and depth growth, including New Product Introduction (NPI) purchases, and more.